This month, let’s examine the fourth principle for success. 4. BE CORRECTED BY YOUR DEFEATS. Learn from your mistakes. In Joshua1:7 God tells Joshua, “Be strong and very courageous and be careful to obey all the law my servant Moses gave you. Don’t turn from it to the right or to the left [don’t get off track] that you may be successful wherever you go.” Be careful. Don’t get sidetracked. When you make a mistake, don’t get off course. There’s an entire industry that makes a profit on your mistakes. They’re built around the fact that you’re imperfect. It’s the pencil eraser industry. If everybody were perfect, we wouldn’t need pencil erasers. Nobody would ever make any mistakes. There’s an entire industry making a profit off your boo-boos! Be corrected by your defeats. Successful people learn from their failures. They learn from their mistakes. Unsuccessful people give up after their first failure. A young executive came to a senior executive and said, “I want to know the secret of success.” The wise old executive said, “The secret of success, young man, is making the right decisions.” “Great! How do you learn to make right decisions?” the young man asked. Edison said, “Don’t call it a failure. Call it an education.” Don’t call it a mistake, call it an education. If that’s true some of us are highly educated! Geniuses! Joshua 7 describes the story of the defeat of the Israelites in a little town called Ai. Joshua and the children of Israel went into the Promised Land and won battles right and left. They took over Jericho, the most fortified city in the country, and they were triumphant everywhere they went. They couldn’t lose. They were invincible. Or so it seemed. Then they came to a little town named Ai with several hundred people in it. They said, “That’s nothing. Let’s just send out a platoon to wipe those guys out. We don’t even need to send our army.” They sent out the platoon and lost the battle. They were failures. They turned tail and ran. Joshua comes back and cries before the Lord, “What’s happening, God? You brought us through the Red Sea. You brought us through the desert. Forty years and You brought us to the Promised Land. We’re winning big victories and then some little, two bit town embarrasses us.” Isn’t that the truth? It’s the Ai’s of life that kill us, not the Jericho’s. It’s the little things that can destroy us. Joshua tore his clothes and he fell face down on the ground before the ark of the Lord and remained there until evening. Joshua is praying and weeping and God comes to him, and in verse 10, God says to Joshua, “Stand up, what are you doing on your face?” Get up and do something about it. Verse ten tells us, “Israel has sinned and they’ve violated my covenant.” When they were taking the city of Jericho, one man named Achan kept some of the spoils of the war for personal profit and God had told them not to keep any of the spoils of war in that particular battle. One man disobeyed the Lord and his disobedience affected the rest of the people. Joshua got to his feet, found Achan and his family, and confronted him with this sin. They punished the man and from that point on, God gave them victory again. What’s the point? When you have been defeated, when you’ve failed, when you’ve made a mistake; simply discover the cause and take the appropriate action. That’s what made Joshua a successful person. Great achievers know how to do two things. 1) They’re big enough to admit it when they’re wrong. They can say, “I was wrong.” They can admit error. 2) They do something about it. They don’t just stand there and moan and groan and have a pity party. They do something about it. They learn from their mistakes. We always learn more from failure than we do from our successes. I cringe at some of the mistakes I have made in my life. There have been times when I made some poor judgments, did some dumb things, and really embarrassed myself. I cringe at those memories. But I’m also grateful for the lessons I’ve learned along the way. Be corrected by your defeats. Try to learn from others as they face defeat. Join me next month for the final installment of God’s strategy for your success. 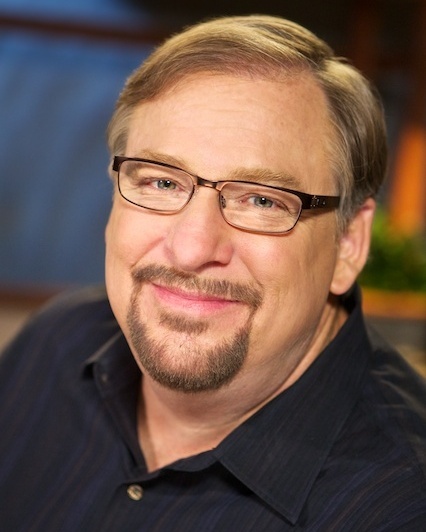 Rick Warren is the Founding Pastor of Saddleback Church.He is also the author of the bestselling books, Purpose Driven Life and Purpose Driven Church.